The Aegis Ballistic Missile Defense System. 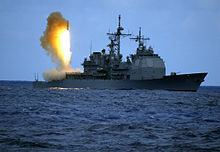 A RIM-161 Standard Missile 3 anti-ballistic missile is launched from USS Shiloh, a U.S. Navy Ticonderoga-class cruiser. The United States, Russia, China, India, Israel, France, and Taiwan have all developed such air defense systems. In the United States, missile defense was originally the responsibility of the U.S. Army. The U.S. Missile Defense Agency has developed maritime systems and command and control that will eventually be transferred to the Navy and Air Force for operation and sustainment. These types/ranges include strategic, theater and tactical. Each entails unique requirements for intercept, and a defensive system capable of intercepting one missile type frequently cannot intercept others. However, there is sometimes overlap in capability. Targets long-range ICBMs, which travel at about 7 km/s (15,700 mph). Examples of currently active systems: Russian A-135 system which defends Moscow, and the U.S. Ground-Based Midcourse Defense system that defends the United States from missiles launched from Asia. Geographic range of strategic defense can be regional (Russian system) or national (U.S. system). Targets medium-range missiles, which travel at about 3 km/s (6,700 mph) or less. In this context, the term "theater" means the entire localized region for military operations, typically a radius of several hundred kilometers. Defense range of theater defensive systems is usually on this order. Examples of deployed theater missile defenses: Israeli Arrow missile, American THAAD, and Russian S-400. Targets short-range tactical ballistic missiles, which usually travel at less than 1.5 km/s (3,400 mph). Tactical anti-ballistic missiles (ABMs) have short ranges, typically 20–80 km (12–50 miles). Examples of currently-deployed tactical ABMs: American MIM-104 Patriot and Russian S-300V. Ballistic missiles can be intercepted in three regions of their trajectory: boost phase, midcourse phase, or terminal phase. Intercepting the missile while its rocket motors are firing, usually over the launch territory (e.g., American aircraft-mounted laser weapon Boeing YAL-1 [program canceled]). Bright, hot rocket exhaust makes detection and targeting easier. Decoys cannot be used during boost phase. At this stage, the missile is full of flammable propellant, which makes it very vulnerable to explosive warheads. Intercepting the missile in space after the rocket burns out (example: American Ground-Based Midcourse Defense (GMD), Chinese SC-19 & DN-series missiles, Israeli Arrow 3 missile). Extended decision/intercept time (the coast period through space before reentering the atmosphere can be several minutes, up to 20 minutes for an ICBM). Very large geographic defensive coverage; potentially continental. Requires large, heavy anti-ballistic missiles and sophisticated powerful radar which must often be augmented by space-based sensors. Must handle potential space-based decoys. Smaller, lighter anti-ballistic missile is sufficient. Balloon decoys do not work during reentry. Smaller, less sophisticated radar required. Very short intercept time, possibly less than 30 seconds. Possible blanketing of target area with hazardous materials in the case of detonation of nuclear warhead(s). Missile defense can take place either inside (endoatmospheric) or outside (exoatmospheric) the Earth's atmosphere. The trajectory of most ballistic missiles takes them inside and outside the Earth's atmosphere, and they can be intercepted in either place. There are advantages and disadvantages to either intercept technique. Some missiles such as THAAD can intercept both inside and outside the Earth's atmosphere, giving two intercept opportunities. Endoatmospheric anti-ballistic missiles are usually shorter ranged (e.g., American MIM-104 Patriot Indian Advanced Air Defence). Exoatmospheric anti-ballistic missiles are usually longer-ranged (e.g., American GMD, Ground-Based Midcourse Defense). A common countermeasure that attacking parties use to disrupt the efficacy of Missile Defense Systems are the simultaneous launching of decoys from the primary launch sight or from the exterior of the main attacking missile itself. These decoys are usually small, lightweight dud rockets that take advantage of the interceptor sensors tracking and fool it by making many different targets available in an instant, This accomplished via the releasing of decoys in certain phases of flight. Because objects of differing weights follow the same trajectory when in space, decoys released during the midcourse phase can prevent interceptor missiles from accurately identifying the warhead. This could force the defense system to attempt to destroy all incoming projectiles, which masks the true attacking missile and lets it slip by the defense system. This categorization of decoy is the most similar to the standard understanding of what a missile decoy is. These types of decoys attempt to mask the attacking ICBM via the release of many similar missiles. This type of decoy confuses the missile defense system by the sudden replication the shear amount of similar targets there are. Knowing that no defense system is 100% reliable, this confusion within the targeting of the defense system would cause the system to target each decoy with equal priority and as if it was the actual warhead, allowing the real warheads chance of passing through the system and striking the target to increase drastically. Similar to replica decoys, these types of decoys also take advantage of the limitations in number within the missile defense systems targeting. However, rather than using missiles of similar build and trace to the attacking warhead, these types of decoys all have slightly different appearances from both each other and the warhead itself. This creates a different kind of confusion within the system; rather than creating a situation where each decoy (and the warhead itself) appears the same and is therefore targeted and treated exactly like the "real" warhead, the targeting system simply does not know what is the real threat and what is a decoy due to the mass amount of differing information. This creates a similar situation as the result of the replica decoy, increasing the chance that the real warhead passes through the system and strikes the target. This is perhaps the most "gung-ho" approach to countering missile defense systems that are designed to destroy ICBM's and other forms of nuclear weaponry. Rather than using many missiles equipped with nuclear warheads as their main weapon of attack, this idea involves the release of biological or chemical sub-munition weapons/agents from the missile shortly after the boost phase of the attacking ICBM. Because missile defense systems are designed with intent to destroy main attacking missiles or ICBM's, this system of sub-munition attack is too numerous for the system to defend against while also distributing the chemical or biological agent across a large area of attack. There is currently no proposed countermeasure to this type of attack except through diplomacy and the effective banning of biological weaponry and chemical agents within war. However, this does not guarantee that this countermeasure to missile defense system will not be abused via extremists/terrorists. An example of this sever threat can be further seen in North Korea's testing of anthrax tipped ICBM's in 2017. Command and control systems is a hardware and software interface that integrates a multitude of sensory information at a centralized center for the ballistic missile defense system (BMDS). The command center allows for human management in accordance to the incorporated sensory information- BMDS status, system coverage, and ballistic missile attacks. The interface system helps build an image of the battle scenario or situation which enables the user to select the optimal firing solutions. The first C2BMC system became operational in the year 2004. Since then, many elements have been added to update the C2BMC which act to provide further sensory information and allow for enhanced communications between combatant commanders. The C2BMC is even capable of initiating live planning system before any engagement has even started. Link-16 is a data link that networks communication between land, air, and sea forces to support joint operations and improve operability. The system is intended to improve the interoperability for joint operations of NATO as well as coalition forces. Link-16 is also used by the U.S. Army and Navy for air and sea operations. An important feature of Link-16 is its ability to broadcast information simultaneously to as many users as needed. A unique feature of Link-16 is its ability to act as nodes which allows for a multitude of distributed forces to operate cohesively. The newest generation of Link-16 is the Multifunctional Information Distribution System Low Volume Terminal (MIDS LVT). It is a much smaller unit that can be fitted on air, ground, and sea units to incorporate data. The MIDS LVT terminals are installed on most bombers, aircraft, UAV's, tankers, allowing for the incorporation of most air defense systems. The IBCS is seen as the future for command and control systems for U.S. army defense systems. It's designed to integrate data relaying between weapon launchers, radars, and the operators which allow air defense units to fire interceptors with information being relayed amongst radars. This advantage of such system increases the area in which an air unit can defend. More importantly, it will reduce interceptor waste by reducing the probability more than one air defense unit launch unnecessary interceptors towards the same target. The IBCS is intended to replace other command and control systems already in use. The IBCS is also capable of being comparable with that of foreign military. There are some intentions for the use of IBCS on a global level with the global C2BMC system. The IBCS system is intended to be operational in 2019; between 2016 to 2017, implementation of IBCS had to be put on hold due to software issues with the system. allows for ease of engagement due to its versatility instead of being limited to a particular unit capabilities. In the 1950s and 1960s, Missile Defense meant defense against strategic (usually nuclear-armed) missiles. The technology mostly centered around detecting offensive launch events and tracking inbound ballistic missiles, but with limited ability to actually defend against the missile. The Soviet Union achieved the first nonnuclear intercept of a ballistic missile warhead by a missile at the Sary Shagan antiballistic missile defense test range on 4 March 1961. Throughout the 1950s and 1960s, the United States Project Nike air defense program focused initially on targeting hostile bombers before shifting focus to targeting ballistic missiles. In the 1950s, the first United States anti-ballistic missile system was the Nike Hercules, which had the ability to intercept incoming short-range ballistic missiles, but not intermediate-range ballistic missiles (IRBMs) or ICBMs. This was followed by the Nike Zeus, which was capable of intercepting ICBMs by using a nuclear warhead, upgraded radar systems, faster computers, and control systems that were more effective in the upper atmosphere. However it was feared the missile's electronics may be vulnerable to x-rays from a nuclear detonation in space. A program was started to devise methods of hardening weapons from radiation damage. By the early 1960s the Nike Zeus was the first anti-ballistic missile to achieve hit-to-kill (physically colliding with the incoming warhead). In 1963, Secretary of Defense Robert McNamara diverted funds from the Zeus missile program, and instead directed that funding to the development of the Nike-X system, which utilized the high-speed, short-range Sprint missile. These missiles were meant to intercept incoming warheads after they had descended from space and were only seconds from their targets. To accomplish this, Nike-X required advances in missile design to make the Sprint missile quick enough to intercept incoming warheads in time. The system also included advanced active electronically scanned array radar systems and a powerful computer complex. During the development of Nike-X, controversy over the effectiveness of anti-ballistic missile systems became more prominent. Critiques of the Nike-X included an estimate that the anti-ballistic missile system could be defeated by Soviets manufacturing more ICBMs, and the cost of those additional ICBMs needed to defeat Nike-X would also cost less than what the United States would spend on implementing Nike-X. Additionally, McNamara reported that a ballistic missile system would save American lives at the cost of approximately $700 per life, compared to a shelter system that could save lives at a lower cost of approximately $40 per life. As a result of these estimations, McNamara opposed implementation of Nike-X due to the high costs associated with construction and perceived poor cost-effectiveness of the system, and instead expressed support for pursuing arms limitations agreements with the Soviets. After the Chinese government detonated their first hydrogen bomb during Test No. 6. in 1967, McNamara modified the Nike-X program into a program called Sentinel. This program's goal was to protect major U.S. cities from a limited ICBM attack, especially on one from China. This would be done by building fifteen sites across the continental US, and one site in each of Alaska and Hawaii. This in turn reduced tensions with the Soviet Union, which retained the offensive capability to overwhelm any U.S. defense. McNamara favored this approach as deploying the Sentinel program was less costly than a fully implemented Nike-X program, and would reduce Congressional pressures to implement an ABM system. In the months following the announcements regarding the Sentinel program, Secretary of Defense Robert McNamara stated: "Let me emphasize—and I cannot do so too strongly—that our decision to go ahead with a limited ABM deployment in no way indicates that we feel an agreement with the Soviet Union on the limitation of strategic nuclear offensive and defensive forces is in any way less urgent or desirable." The Soviet Union began installing the A-35 anti-ballistic missile system around Moscow in 1965 and would become operational by 1971, but there were known flaws with the design such as an inability to defend against MIRV style weapons. During installation, a Ministry of Defense commission concluded that the system should not be fully implemented, reducing the capabilities of the completed system. That system was later upgraded to the A-135 anti-ballistic missile system and is still operational. 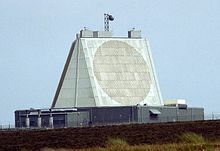 As part of the Anti-Ballistic Missile Treaty in 1972, all radars for detecting missiles were placed on the edges of the territory and faced outward. The SALT I talks began in 1969, and led to the Anti-Ballistic Missile Treaty in 1972, which ultimately limited the U.S. and U.S.S.R. to one defensive missile site each, with no more than 100 missiles per site. This included both ABM interceptor missiles as well as launchers. Originally, the agreement made by the Nixon administration and the Soviet Union stated that both of the two nations were each allowed to have two ABM defensive systems present in their own countries. The goal was to effectively have one ABM defense system located near each nation's capital city as well as another ABM defense system placed near the nation's most important or strategical ICBM field. This treaty allowed for an effective form of deterrence for both sides as if either side were to make an offensive move, the other side would be capable of countering that move. However, a few years later in 1974 both sides reworked the treaty to include only one ABM defensive system present around an ICBM launch area or the nation's capital city. This occurred once both sides determined the other side was not going to construct a second ABM defensive system. Along with limiting the amount of ballistic missile defense systems each nation could have, the treaty also stated if either country desired to have a radar for incoming missile detection, the radar system must be located on the outskirts of the territory and must be aligned in the opposite direction of one's own country. This treaty would end up being the precedent set for future missile defense programs, as any systems that were not stationary and land-based were a violation of the treaty. As a result of the treaty and of technical limitations, along with public opposition to nearby nuclear-armed defensive missiles, the U.S. Sentinel program was re-designated the Safeguard Program, with the new goal of defending U.S. ICBM sites, not cities. The U.S. Safeguard system was planned to be implemented in various sites across the US, including at Whiteman AFB in Missouri, Malmstrom AFB in Montana, and Grand Forks AFB in North Dakota. The Anti-Ballistic Missile Treaty of 1972 placed a limit of two ABM systems within the US, causing the work site in Missouri to be abandoned, and the partially-completed Montana site was abandoned in 1974 after an additional agreement between the US and USSR that limited each country to one ABM system. As a result, the only Safeguard system that was deployed was to defend the LGM-30 Minuteman ICBMs near Grand Forks, North Dakota. However, It was deactivated in 1976 after being operational for less than four months due to a changing political climate plus concern over limited effectiveness, low strategic value, and high operational cost. In the early 1980s, technology had matured to consider space based missile defense options. Precision hit-to-kill systems more reliable than the early Nike Zeus were thought possible. With these improvements, the Reagan Administration promoted the Strategic Defense Initiative, an ambitious plan to provide a comprehensive defense against an all-out ICBM attack. In pursuit of that goal, the Strategic Defense Initiative investigated a variety of potential missile-defense systems, which included systems utilizing ground-based missile systems and space-based missile systems, as well as systems utilizing lasers or particle beam weapons. This program faced controversy over the feasibility of the projects it pursued, as well as the substantial amount of funding and time required for the research to develop the requisite technology. The Strategic Defense Initiative earned the nickname "Star Wars" due to criticism from Senator Ted Kennedy in which he described the Strategic Defense Initiative as "reckless Star Wars schemes.". Reagan established the Strategic Defense Initiative Organization (SDIO) to oversee the development of the program's projects. Upon request by the SDIO, the American Physical Society (APS) performed a review of the concepts being developed within SDIO and concluded that all of the concepts pursuing use of Directed Energy Weapons were not feasible solutions for an anti-missile defense system without decades of additional research and development. Following the APS's report in 1986, the SDIO switched focus to a concept called the Strategic Defense System, which would utilize a system of space-based missiles called Space Rocks which would intercept incoming ballistic missiles from orbit, and would be supplemented by ground-based missile defense systems. In 1993, the SDIO was closed and the Ballistic Missile Defense Organization (BMDO) was created, which focuses on ground-based missile defense systems utilizing interceptor missiles. In 2002, BMDO's name was changed to its current title, the Missile Defense Agency (MDA). See National Missile Defense for additional details. In the early 1990s, missile defense expanded to include tactical missile defense, as seen in the first Gulf War. Although not designed from the outset to intercept tactical missiles, upgrades gave the Patriot system a limited missile defense capability. The effectiveness of the Patriot system in disabling or destroying incoming Scuds was the subject of Congressional hearings and reports in 1992. Various ICBMs utilized by varying countries. In the time following the agreement of the 1972 Anti-Ballistic Missile Treaty, it was becoming increasingly more and more difficult for the United States to create a new missile defense strategy without violating the terms of the treaty. During the Clinton administration, the initial goal the United States had interest in, was to negotiate with the former Soviet Union, which is now Russia, and hopefully agree to a revision to the treaty signed a few decades prior. In the late 1990s the United States had interest in an idea termed NMD or National Missile Defense. This idea essentially would allow the United States to increase the number of ballistic missile interceptors that would be available to missile defense personnel at the Alaska location. While the initial ABM treaty was designed primarily to deter the Soviet Union and help create a period of détente, the United States was primarily fearing other threats such as Iraq, North Korea, and Iran. The Russian government was not interested in making any sort of modification to the ABM treaty that would allow for technology to be developed that was explicitly banned when the treaty was agreed upon. However, Russia was interested in revising the treaty in such a way that would allow for a more diplomatic approach to potential missile harboring countries. During this period, the United States was also seeking assistance for their ballistic missile defense systems from Japan. Following the testing of the Taepo Dong missile by the North Korean government, the Japanese government became more concerned and inclined to accept a partnership for a BMD system with the United States. In late 1998, Japan and the United States agreed to the Naval Wide Theater system which would allow the two sides to design, construct, and test ballistic missile defense systems together. Nearing the end of Clinton's time in office, it had been determined that the NMD program was not as effective as the United States would have liked, and the decision was made to not employ this system while Clinton served out the rest of his term. The decision on future of the NMD program was going to be given to the next president in line, who ultimately would end up being George W. Bush. In the late 1990s, and early 2000s, the issue of defense against cruise missiles became more prominent with the new Bush Administration. In 2002, President George W. Bush withdrew the US from the Anti-Ballistic Missile Treaty, allowing further development and testing of ABMs under the Missile Defense Agency, as well as deployment of interceptor vehicles beyond the single site allowed under the treaty. During the Bush's time in office, the potentially threatening countries to the United States included North Korea as well as Iran. While these countries might not have possessed the weaponry that many countries containing missile defense systems had, the Bush administration expected an Iranian missile test within the next ten years. In order to counter the potential risk of North Korean missiles, the United States Department of Defense desired to create missile defense systems along the west coast of the United States, namely in both California and Alaska. A NORAD Distant Early Warning Line (DEW) station in western Greenland is visible in the distance beyond the snow-drifted equipment pallets in the foreground of this photograph. The DEW Line was designed to track inbound ballistic missiles. There are still technological hurdles to an effective defense against ballistic missile attack. The United States National Ballistic Missile Defense System has come under scrutiny about its technological feasibility. Intercepting midcourse (rather than launch or reentry stage) ballistic missiles traveling at several miles per second with a "kinetic kill vehicle" has been characterized as trying to hit a bullet with a bullet. Despite this difficulty, there have been several successful test intercepts and the system was made operational in 2006, while tests and system upgrades continue. Moreover, the warheads or payloads of ballistic missiles can be concealed by a number of different types of decoys. Sensors that track and target warheads aboard the kinetic kill vehicle may have trouble distinguishing the "real" warhead from the decoys, but several tests that have included decoys were successful. Nira Schwartz's and Theodore Postol's criticisms about the technical feasibility of these sensors have led to a continuing investigation of research misconduct and fraud at the Massachusetts Institute of Technology. In February 2007, the U.S. missile defense system consisted of 13 ground-based interceptors (GBIs) at Fort Greely, Alaska, plus two interceptors at Vandenberg Air Force Base, California. The U.S. planned to have 21 interceptor missiles by the end of 2007. The system was initially called National Missile Defense (NMD), but in 2003 the ground-based component was renamed Ground-Based Midcourse Defense (GMD). As of 2014, the Missile Defense Agency had 30 operational GBIs. Defending against cruise missiles is similar to defending against hostile, low-flying manned aircraft. As with aircraft defense, countermeasures such as chaff, flares, and low altitude can complicate targeting and missile interception. High-flying radar aircraft such as AWACS can often identify low flying threats by using doppler radar. Another possible method is using specialized satellites to track these targets. By coupling a target's kinetic inputs with infrared and radar signatures it may be possible to overcome the countermeasures. In March 2008, the U.S. Congress convened hearings to re-examine the status of missile defense in U.S. military strategy. Upon taking office, President Obama directed a comprehensive review of ballistic missile defense policy and programs. The review's findings related to Europe were announced on 17 September 2009. The Ballistic Missile Defense Review (BMDR) Report was published in February 2010. The Conference of National Armaments Directors (CNAD) is the senior NATO committee which acts as the tasking authority for the theater missile defense program. The ALTBMD Program Management Organization, which comprises a steering committee and a program office hosted by the NATO C3 Agency, directs the program and reports to the CNAD. The focal point for consultation on full-scale missile defense is the Reinforced Executive Working Group. The CNAD is responsible for conducting technical studies and reporting the outcome to the Group. The NRC Ad hoc Working Group on TMD is the steering body for NATO-Russia cooperation on theater missile defense. In September 2018, a consortium of 23 NATO nations met to collaborate on the Nimble Titan 18 integrated air and missile defense (IAMD) campaign of experimentation. Active Layered Theater Ballistic Missile Defense System is "ALTBMD" for short. As of early 2010, the Alliance has an interim capability to protect troops in a specific area against short-range and medium-range ballistic missiles (up to 3,000 kilometers). The end system consist of a multi-layered system of systems, comprising low- and high-altitude defenses (also called lower- and upper-layer defenses), including Battle Management Command, Control, Communications and Intelligence (BMC3I), early warning sensors, radar, and various interceptors. NATO member countries provide the sensors and weapon systems, while NATO has developed the BMC3I segment and facilitate the integration of all these elements. A Missile Defense Feasibility Study was launched after NATO's 2002 Prague summit. The NATO Consultation, Command and Control Agency (NC3A) and NATO’s Conference of National Armaments Directors (CNAD) were also involved in negotiations. The study concluded that missile defense is technically feasible, and it provided a technical basis for ongoing political and military discussions regarding the desirability of a NATO missile defense system. During the 2008 Bucharest summit, the alliance discussed the technical details as well as the political and military implications of the proposed elements of the U.S. missile defense system in Europe. Allied leaders recognized that the planned deployment of European-based U.S. missile defense assets would help protect North American Allies, and agreed that this capability should be an integral part of any future NATO-wide missile defense architecture. However, these opinions are in the process of being reconstructed given the Obama administration’s decision in 2009 to replace the long-range interceptor project in Poland with a short/medium range interceptor. Russian Foreign Minister Sergei Lavrov has stated that NATO's pattern of deployment of Patriot missiles indicates that these will be used to defend against Iranian missiles in addition to the stated goal of defending against spillover from the Syrian civil war. Under the auspices of the NATO-Russia Council, a 2003 study assessed possible levels of interoperability among in-theater missile defense systems of NATO allies and Russia. Together with the interoperability study, several computer-assisted exercises have been held to provide the basis for future improvements to interoperability and to develop mechanisms and procedures for joint operations in the area of in-theater missile defense. In order to accelerate the deployment of a missile shield over Europe, Barack Obama sent ships with the Aegis Ballistic Missile Defense System to European waters, including the Black Sea as needed. In 2012 the system will achieve an "interim capability" that will for the first time offer American forces in Europe some protection against IRBM attack. However these interceptors may be poorly placed and of the wrong type to defend the United States, in addition to American troops and facilities in Europe. According to BioPrepWatch, NATO has signed a 136 million euro contract with ThalesRaytheonSystems to upgrade its current theatre missile defense program. The project, called ACCS Theatre Missile Defense 1, will bring new capabilities to NATO’s Air Command and Control System, including updates for processing ballistic missile tracks, additional satellite and radar feeds, improvements to data communication and correlation features. The upgrade to its theatre missile defense command and control system will allow for NATO to connect national sensors and interceptors in defense against short and medium-range ballistic missiles. According to NATO’s Assistant Secretary General for Defense Investment Patrick Auroy, the execution of this contract will be a major technical milestone forward for NATO’s theatre missile defense. The project was expected to be complete by 2015. An integrated air and missile defense (IAMD) capability will be delivered to the operational community by 2016, by which time NATO will have a true theatre missile defense. IAMD The SMDC is leading the Army's laser efforts to replace MIM-104 Patriot. ^ "Demonstration of integrated missile air defense system by June next year: Dr VK Saraswat". domain-b.com. 10 December 2007. Retrieved 21 November 2010. ^ a b c d e f g Sessler, Andrew M.; et al. (April 2000). "Countermeasures: A Technical Evaluation of the Operational Effectiveness of the Planned US National Missile Defense System" (PDF). MIT Security Studies Program. ^ Lewis, George N. (2017). "Ballistic missile defense effectiveness". Washington, DC, USA: 030007. doi:10.1063/1.5009222. ^ Mizokami, Kyle (20 December 2017). "North Korea Is Reportedly Testing Anthrax-Tipped ICBMs". Popular Mechanics. Retrieved 19 April 2019. ^ Pigeau, Ross. "RE-CONCEPTUALIZING COMMAND AND CONTROL" (PDF). journal.forces. ^ "Command and Control, Battle Management, and Communications". ^ "Command and Control, Battle Management, and Communications (C2BMC)". ^ "GMD Fire Control and Communication". ^ "DOD Dictionary of Military and Associated Terms" (PDF). jcs.mil. ^ "Integrated Air and Missile Defense Battle Command System (IBCS)". ^ Yanarella, Ernest J. (2010). The missile defense controversy : technology in search of a mission. Lexington: University Press of Kentucky. ISBN 9780813128092. OCLC 775301998. ^ Life Magazine, September 29, 1967. Life Magazine. ^ Bulletin of the Atomic Scientists, December, 1967. ^ "CRS: Ballistic Missile Defense: Historical Overview, January 28, 2008 - WikiLeaks". wikileaks.org. Retrieved 19 April 2019. ^ John W. Finney (25 November 1975). "Safeguard ABM System to Shut Down". New York Times. "the utility of Safeguard to protect Minuteman will be essentially nullified in the future"
^ The Science and Technology of Directed Energy Weapons (Technical report). APS. April 1987. ^ Federation of American Scientists. "Star Wars - Operations". Archived from the original on 26 May 2006. Retrieved 5 April 2006. ^ "CRS: Japan-U.S. Cooperation on Ballistic Missile Defense: Issues and Prospects, March 19, 2002 - WikiLeaks". wikileaks.org. Retrieved 19 April 2019. ^ "CRS: National Missile Defense: Russia's Reaction, June 14, 2002 - WikiLeaks". wikileaks.org. Retrieved 19 April 2019. ^ "CRS: Long-Range Ballistic Missile Defense in Europe, December 8, 2008 - WikiLeaks". wikileaks.org. Retrieved 19 April 2019. ^ Pierce, Charles P. (23 October 2005). "Going Postol". The Boston Globe. Retrieved 21 November 2010. ^ "3rd missile interceptor field for Fort Greely". Army Times. 8 February 2007. Retrieved 21 November 2010. ^ "Missile Defense: Next Steps for the USA's GMD". Defense Industry Daily. 1 June 2015. ^ "2010 Ballistic Missile Defense Review (BMDR) Fact Sheet" (PDF). United States Department of Defense. 3 March 2010. ^ "Ballistic Missile Defense Review Report" (PDF). United States Department of Defense. February 2010. ^ "Lavrov: Turkey's Patriot Missiles to Counter Iran Threats"
^ "Missile defence". NATO. 24 June 2011. ^ "Russia expresses concern over U.S. warship Black Sea visit." RIA Novosti, 12 June 2011. ^ "NATO chief determined to move ahead with missile shield." AFP, 14 May 2012. ^ "Pentagon study: U.S. defense shield against Iran missiles is seriously flawed." ^ Sievers, Lisa (24 June 2013). "NATO signs contract to update missile defense". BioPrepWatch. Archived from the original on 8 March 2015. Retrieved 8 July 2013. ^ Harrington, Jack (June 2013). "A major accomplishment for the NATO alliance"" (PDF). p. 3. Retrieved 10 May 2015. Nicole C. Evans, "Missile Defense: Winning Minds, Not Hearts", Bulletin of the Atomic Scientists, September/October 2004. Daniel Möckli, "US Missile Defense: A Strategic Challenge for Europe", CSS Analyses in Security Policy no. 12, April 2007. Ishmael Jones, The Human Factor: Inside the CIA's Dysfunctional Intelligence Culture, New York: Encounter Books (2010) (ISBN 978-1594032233). Missiles intelligence. Steven Donald Smith, Missile Defense Program Moves Forward, 2006.